1 What is HostGator Web Hosting? 10 Summary and Conclusion: Is HostGator Worth the Money? What is HostGator Web Hosting? A common problem among bloggers and website owners is finding a reliable host. Let’s face it; there are lots of web hosts that claim they are the best but only interested in taking your money. A bad host can create a serious problem for any website owner, and that’s why it’s very important to have a quality web host for all your website hosting needs. In this HostGator reviews, I will provide you with in-depth personal and honest experience of HostGator hosting services. HostGator was founded by Brent Oxley during his university days back in 2002, and the company has overcome many hurdles to become one of the biggest names in web hosting industry. EIG acquired HostGator after the group noticed the potential in HostGator. The company started in Florida but moved to Texas in 2007 due to its quick growth and expansion. HostGator base is in Houston with an office in Austin and an Indian and Brazilian subsidiary. HostGator serves more than 400,000 customers from 200 countries of the world with over 8 million domains. The company has about hundreds employees on their payroll but set to add additional 200 in the next two years. HostGator has lots of attractive plans that made it darling to many webmasters. Their cheap plan and solid hosting have won over many customers in the recent years. Each of these plans depends on the webmaster’s need and budget. Hatchling plan comes with unlimited disk space and at a much-reduced price. You will also get unmetered bandwidth, good support, and shared SSL certificate. However, the only downside of this plan is it allows only single domain. Baby Plan is HostGator’s most popular plan. We found this plan to be very effective for anyone that wishes to run multiple personal websites/blogs unless you need a Private IP with a Toll-free number, in which Business plan will be more suitable. The baby plan comes with unlimited disk space, One Click Installs, unlimited domains and unmetered bandwidth. You can get it starting from $5.95 per month. HostGator business plan allows you to have private SSL and IP, unlimited disk space, unlimited domains, unmetered bandwidth and even free toll-free number. It starts from $10 per month, and this price is subjected to changes. Sometimes you might be even possible to get the “Free upgrade” for the business plan at only $5.95 per month. HostGator offers VPS plans to meet the needs of their clients. The control panel does not come with a hosting plan, but you will have full assistance from HostGator support to manage it. All their VPS servers utilize 2 cores or 4 cores CPU. The price starts from $19.95 to $39.95 per month. HostGator also offers cloud-based hosting. Their Hatchling cloud hosting plan starts at $7.16 per month, with 2 Core CPU, shared SSL, and single domain included. Their most advanced business cloud plan includes free private SSL and IP. HostGator manages servers across the different location of the world. Dedicated servers are meant for larger businesses and high-traffic websites. The servers allow maximum customization, installation, configuration and overall flexibility. The plan for dedicated server starts from $76.56 and comes with Intel Xeon Dual Core 2.3GHZ (4 threads), 100 Mbps uplink, 4 GB RAM, 500 GB RAID-1 Drives, 10 TB Bandwidth and 2 dedicated IPS. The features increase depending on the plan you choose. 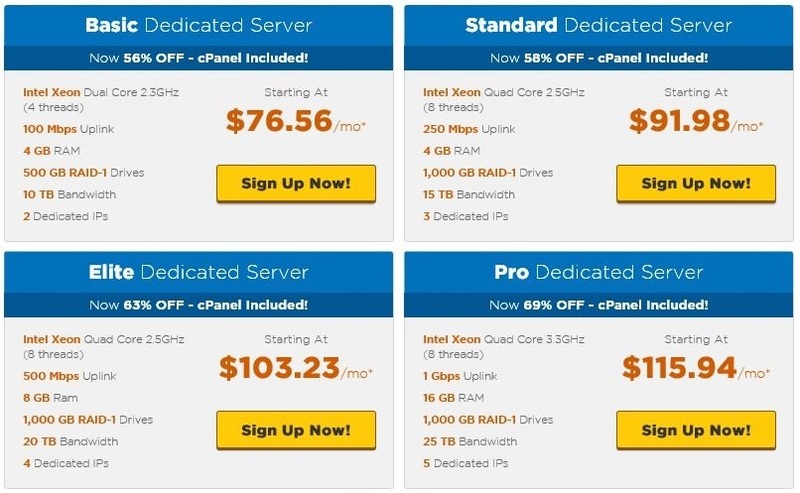 The plan for dedicated server starts from $76.56 and comes with Intel Xeon Dual Core 2.3GHZ (4 threads), 100 Mbps uplink, 4 GB RAM, 500 GB RAID-1 Drives, 10 TB Bandwidth and 2 dedicated IPS. The features increase depending on the plan you choose. HostGator reseller hosting plan allows anybody to become a reseller or even own a full-time web hosting company. Their reseller hosting plan allows you to create cPanel for each of your clients. You can set your own bill. It comes with all the features you need to act like a complete hosting company. Windows hosting is also provided by HostGator. The personal plan is only for single domain hosting while the Enterprise plan can host up to 5 domains. Both HostGator Windows hosting plans include unmetered disk space and bandwidth. The personal plan costs $4.76 per month while the enterprise plan costs $14.36 per month. HostGator also provides domain registration services. Before you can be able to set up any plan on HostGator, you must have a domain name either from them or another domain name registrar. HostGator dot com domain name cost $12.95 a year. The only downside is that you are mostly restricted to working with the WP dashboard, i.e. the WordPress backend. The biggest feature of this hosting plan is that it allows you access to MySQL which is a database management system for your website data. HostGator WP hosting has three plans: Starter, Standard and Business plan. The starter cost about $5.95/mo at the time of writing this review. It allows one site, 25,000 monthly visitors, 50GB storage capacity, 100% free migration, global CDN, automatic malware remove, unlimited email accounts, shared SSL certificate and $100 Google Adwords credits. All the HostGator plans; hatchling, baby, and business come with unlimited amounts of disk space and bandwidth to store emails. HostGator has a limit of 500 outgoing email per hour for each domain. This means that most of the emails will bounce back with an undeliverable error if you exceed the limit. By default, every HostGator cPanel comes with one primary email account. It is recommended to set up a new email account by going to Mail Section in your cPanel. You can as well remove email accounts from this section. This section also allows you to set up your emails to go directly to Horde, SquirrelMail or Roundcube. HostGator allows you to set up your mailbox quotas. HostGator provides 24/7 telephone support, and an online web live chat feature for instant chatting with a customer service agent. 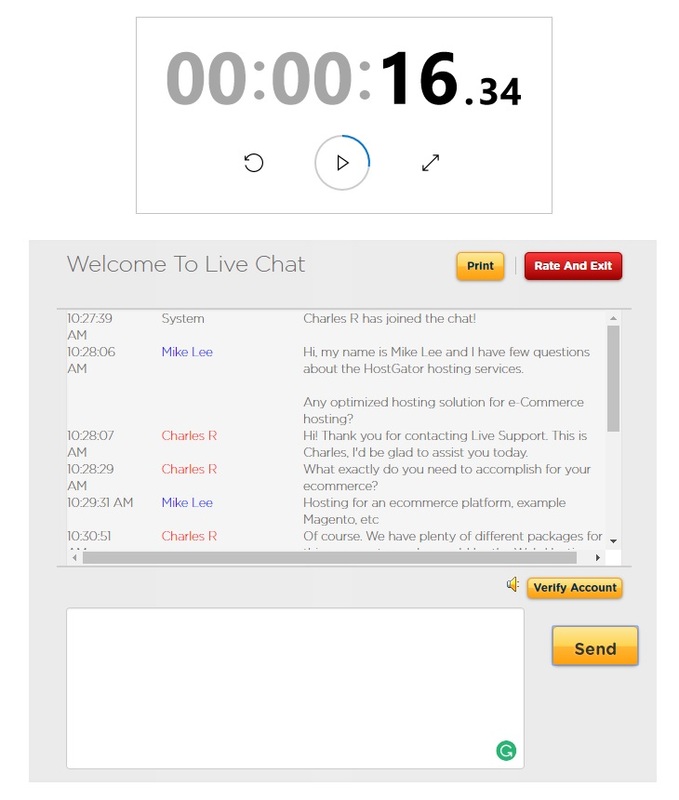 With HostGator live chat service, it can take anywhere between seconds to minutes to get a live agent to chat with you. I have tried their live chat service and it was considered good, read my experience with them below. Their phone tech support works pretty well too as far as you call them during weekdays. Overall, HostGator has a comprehensive customer support which is remarkable considering that most of their plans are very cheap. They provide customers with a very deep knowledge base which contains almost all the answers to practically every possible question you could ask. Always ensure you make use of the knowledge base before contacting the customer support to save you time. 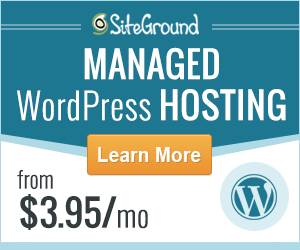 If you are looking for a web hosting company that serving excellent customer support, SiteGround can be a good choice. I have tried their live chat service and I got their reply at 16.34 seconds after I launched the chat. For your information, how fast they get back to you can be varied. If you contact them during peak hours, there is a chance that you might need to wait several minutes or longer. However, from my own experience, it was fast and good. Overall the support staff was polite and professional. The support staff seems to understand their services well and I rated highest for him after I end the chat. Mike Lee: Hi, my name is Mike Lee and I have few questions about the HostGator hosting services. Any optimized hosting solution for e-Commerce hosting? Charles R: Hi! Thank you for contacting Live Support. This is Charles, I’d be glad to assist you today. What exactly do you need to accomplish for your e-Commerce? Mike Lee: Hosting for an e-Commerce platform, example Magento, etc. Charles R: Of course. We have plenty of different packages for this, our most popular would be the Web Hosting package called our Shared Business package and our Cloud Business package. Both come with 1 SSL and dedicated IP address for any site you choose. Mike Lee: Thanks for the information. Is the there any hosting plan that supports email hosting? Any dedicated email hosting solution? Charles R: Not ONLY email but all of our packages do have email. Mike Lee: Can normal shared hosting plan like Hatchling and Baby plan support unlimited email accounts? Mike Lee: Is HostGator offers Free SSL certificate service? Charles R: Only with our Business packages. Mike Lee: Can I get a Dedicated IP from HostGator? Charles R: Yes, you can. The business packages include on for free. Mike Lee: How about shared hosting plan? Charles R: The shared Business plan and the cloud business plan both have a free SSL and IP. Mike Lee: Not with Hatchling and Baby plan? Charles R: Not for free, no. Mike Lee: Available with certain charges, am I right? Mike Lee: Is free domain included in the hosting plans? Mike Lee: Does HostGator offer Domain Privacy Protected service? Charles R: Yes, we do. $12.95 a year. Mike Lee: Can HostGator do the Site Migration for me if I convert to HostGator? Is it free? Charles R: Yes and yes. Mike Lee: Does HostGator offer a Content Delivery Network (CDN)? Charles R: Yes, we do, with CloudFlare and SiteLock (extra). Charles R: Yes, we do have DDoS Protection. Mike Lee: What payment methods does HostGator accept? Mike Lee: Great. Any option for monthly payment instead of annual payment? Charles R: Yes, however, you won’t have the discount that a long term payment would offer. Mike Lee: Thanks for the information. Will consider and thank you for the support! 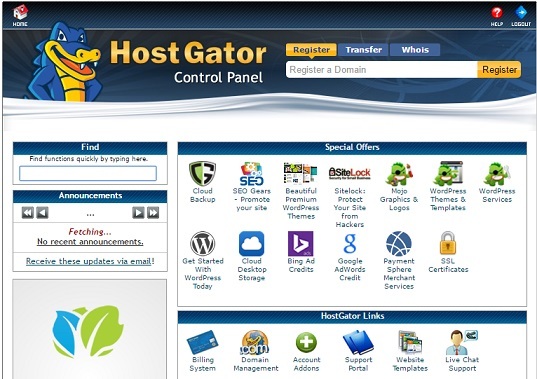 HostGator offers featured service of nameservers and control panel. They use cPanel as their control panel. Continue reading for more information. HostGator NameServers work like every other nameserver to convert the domain name into IP address. When you register a domain name in another domain name registrar other than HostGator but you wish to host your website with HostGator, you must point your domain name to HostGator’s server. You will get information for your NameServers in your welcome email, and you can log in to your domain name dashboard and edit your DNS to point to HostGator. HostGator comes with cPanel 11 for all Linux plans. cPanel is the universal access point to all the features that comes with hosting packages such as WordPress installation, one-click backups, webmail, DNS setting and more. HostGator cPanel is very different from GoDaddy and 1&1 cPanel which have proprietary backends. This one is easier to manage. Moreover, you have the support and knowledge base to guide you anytime if you run into some difficulties. Web host uptime is what a user must consider before getting hosting services because it determines how often your site will be down. HostGator has a remarkably stable uptime. They guarantee 99.9% uptime. HostGator currently has the data center in facilities owned by The Planet in Texas, fire detection, UPS power supply and round-the-clock monitoring by in-house technical staff to ensure the safety of their 12,000 servers on-site. They work with about ten other separate fiber providers and uses hardware from Time Warner and AT&T. HostGator performs weekly backups at their data center for every account except dedicated servers. The company charges $15 to restore the backup if you cannot supply your own backup file. Overall, the HostGator server uptime is reliable. As you can see from the uptime checks above, HostGator achieved several 100% uptime. That’s mean without single server outage within a month. Yes, they did achieve their 99.90 uptime target. From my own experience, this case happened in most of the web hosts. 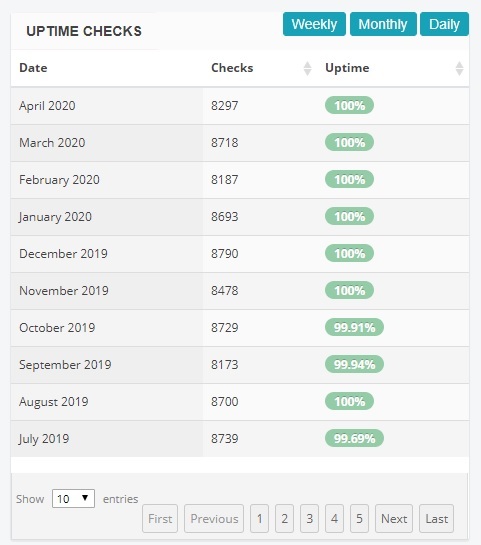 There will be some months where the uptime is not 100%. For me, it is acceptable as long as the uptime is still above the 99% mark. 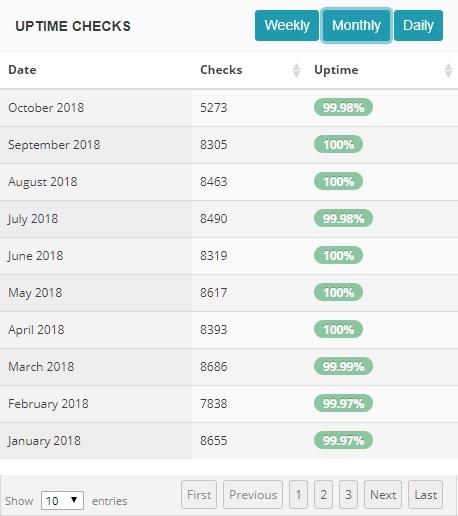 Note: I update this HostGator uptime stats regularly, do bookmark this page if you are interested in checking their uptime performance again. I conducted a server speed test on a website hosted on HostGator. HostGator scored A+, and this proves that HostGator server is reliable. This test was conducted by pinging the website from 8 different locations below, United States, United Kingdom, Singapore, Japan, etc. As you can see below, it performed really well in the United States. For Asia regional country like Singapore, it might take longer response time but overall it is still good enough for the user. Summary and Conclusion: Is HostGator Worth the Money? HostGator has shown how determination pays offers, from a startup by a student with just three servers to a leader in the industry. Many people trusted HostGator and with their domains which speak volume of this web host. Over the years, they’ve been able to avoid many teething problems that are commonly associated with companies embarking on an aggressive growth path. HostGator is affordable, fast, reliable, stable and trusted. There are not a lot of complaints against HostGator support. Moreover, an average user may not require support with their well-designed control panel. If you are looking for a reliable, affordable and open hosting company for your website, we will recommend you go with HostGator. Compare HostGator With Our Top Ranked Web Hosts! thanks for sharing good article. Hostgator have a better service. So I prefer hostgator. Nice post.